WMO Project website (also see here). For project personnel, WMO ELIOS Cloud. 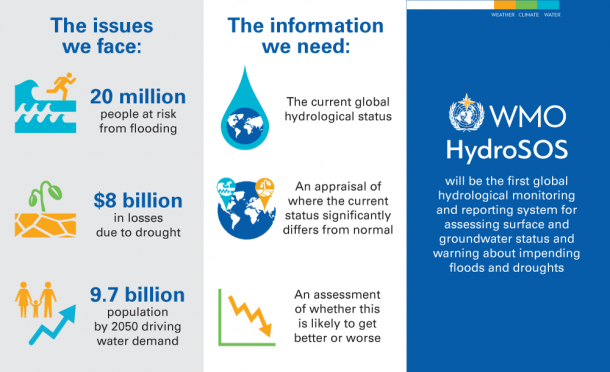 HydroSOS is an initiative led by the World Meteorological Organisation (WMO) to provide global scale information on the current status of surface and groundwater systems. Formulated at an initial planning meeting in Entebbe, Uganda, 26-28th September 2017, and the subsequent meeting of the WMO Commission for Hydrology (CHy) Task Team on 29th September also in Entebbe (chaired by CEH), HydroSOS is a global consortium working at both global and regional/national levels that intends to unify existing approaches into a workable harmonised system, which will be the first such monitoring system to be achieving this at the global scale. My part in HydroSOS is to work on the global pilot system. Press releases: WMO (Sep 2017) and CEH (Sep 2017).